Coffee that is grown in the Blue Mountains of Jamaica is well known for its mellow, full, chocolaty flavor. This coffee has the honor of being officially certified as 100% Jamaican (or Jamaica) Blue Mountain Coffee by Jamaica's Coffee Industry Board. In this guide we will cover how you can avoid common Blue Mountain scams. We'll also show you how and where to buy authentic Jamaican coffee using our blue mountain coffee reviews. How Can You Avoid Buying Counterfeit Coffee? 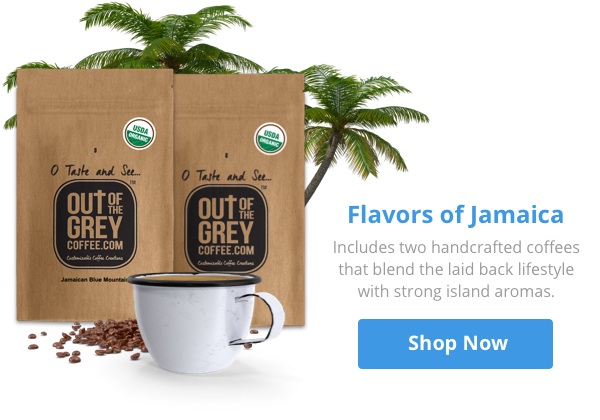 Buy The Best Jamaican Coffee Online! Smooth, delicious 100% Jamaican Blue Mountain Coffee has been a prized gourmet coffee since the early 1700s. At this time, the governor of Jamaica gathered half a dozen Arabica coffee plants in Martinique and brought them home with him. The superb climate, rich volcanic soil and gentle mists of the Jamaican mountains proved to be the perfect climate for coffee production. With a temperature that is always between 5 and 7 lower than that found throughout the rest of the island, these beans are slow maturing. These beans not only produce better tasting coffee, they produce coffee that is better for you. 100% Jamaican Blue Mountain Coffee is rich in taurine and niacin and contains very high antioxidant levels. Furthermore, it has a fraction of the amount of caffeine found in other types of coffee. This coffee is said to be naturally sweet and to have a very intense and strong aroma and a very clean taste. It is a medium roast, and the company does not roast the beans until it has received your order. Volcanica's medium roasted blend uses 30% Blue Mountain coffee with other mountain grown beans. Flavors of Jamaica is said to be chocolaty with a well-balanced and rich flavor. It is also low in acid. Beans for this coffee are high grade and certified. They are handpicked and subjected to an intensive grading system. This system includes sorting for color, density and size. If you have the opportunity to travel to Jamaica, you can tour the plantations and go “coffee tasting” much as people enjoy wine tasting in France and in California. The difference between the beans purchased from these old-time growers and those purchased from plantations is that plantation beans are machine roasted and processed. Those that come from family farms are picked by hand, laid out to dry on bamboo racks and roasted in small batches over wood fires. Naturally beans prepared with these incredible personal touches are quite pricey by the time they have been bought by an importer, packaged and made available to the average consumer. If you are able to take a hike through the Jamaican mountains and actually buy your own cup of coffee straight from the farmer, the experience will certainly be worthwhile no matter what the price. The Blue Mountains of Jamaica, which are located between Port Antonio and Kingston are among the highest mountains found in the Caribbean. Their cool misty climate, fertile soil and superb drainage all combine to create the best conditions for coffee growing. Beans Grown at elevations between 1500 and 3000 feet are labeled as Jamaica high mountain. In addition to elevation, other factors affect the grading and labeling of coffee beans. Factors that are taken into account include the number of defects allowed, the appearance and the size of the beans. While it is popular around the world, more than 80% of the specialty coffee ends up in Japan where it is in great demand. This is because during the 1950s, the café industry was very popular in Japan. During this time, Blue Mountain Coffee was easily obtained and quite affordable. Many Japanese consumers became hooked on its mild, well-rounded flavor. In recent years, genuine, certified Blue Mountain Coffee has been in short supply due to extreme weather events and the global economic downturn. In fact, production in Jamaica has fallen to 1/5 of its all-time 2007 peak due to hurricanes, arboreal disease and beetle infestation. All of these very strongly and negatively impacted Jamaica's coffee plantations. As a result, prices have risen and supplies have dwindled. In ﻿﻿﻿﻿Japan where Blue Mountain Coffee is remarkably popular, this is caused quite a bit of consternation amongst retailers. The industry is gradually getting back on its feet with new trees being planted and the world economy taking an upturn; however, pure, 100% certified Jamaican Blue Mountain Coffee is unlikely to ever be as readily available as it once was. Importer, Jim Coke, who is the CEO of the import company known as Hillman Reinier Commodities has filed a complaint through the Customs Department because he says that companies that use this verbiage are misleading the public. …and at elevations that lie between 3001 feet and 5511 feet can legally be labeled "Blue Mountain". He further explains that companies importing genuine Blue Mountain Coffee must obtain a license from the coffee board and must pay 1% of the revenue they earn with this coffee to the country of Jamaica. He says that companies that misuse this labeling profit unfairly and put licensed importers at a disadvantage. To get the genuine article, you must look for coffee that is labeled as being 100% Jamaican (or Jamaica) Blue Mountain. Furthermore, it must bear the round trademarked logo of the coffee certification board. This logo is a picture of a barrel sitting before a mountain. The combination of this complete description and the official logo will help ensure that you are getting the genuine article. Did you enjoy this guide? Let us know in the comments with your experiences and favorite Jamaican coffee.